Tsar Martyr Nicholas II, Tsarina Martyr Alexandra, and St. Elizabeth the New Martyr of Russia, attended the Holy Canonization of St. Seraphim of Sarov, and Elena Mtovilov, the wife of N. I. Mtovilov, kept this letter addressed to the Tsar Martyr for seventy years, gave this letter to the Tsar Martyr at the service of the glorification of St. Seraphim. The other contents of this letter is unknown, but without a doubt St. Seraphim, spiritually wanted to prepare the Royal Family for the coming tribulations. During the reign of any Tsar of Russia, more saints where canonized during during the time of Tsar Martyr Nicholas II. 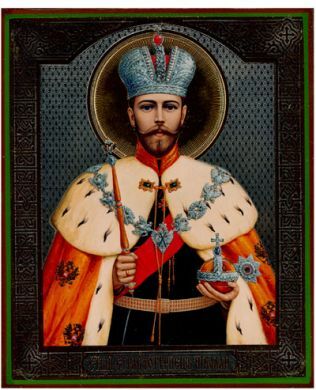 Tsar Martyr Nicholas was a fervent Russian Orthodox Christian who lived as a fervent lover of the Beatitudes of Christ our Lord, and strove to emulate them all. A meek individual and sought after righteousness, and anyone who had the privilege to meet him in person, found him as pure hearted. Peace was so important to the times of the Tsar Martyr that he influenced during his reign to avoid any international disputes, he proposed, the Hague Peace Conference, which was held on May 18, 1899, and served as the precedent for the later League of Nations and United Nations. Mercy was constant also from the Tsar Martyr during his reign, even those who opposed him, giving away vast quantities of his own land to alleviate the plight of those who ha none. The countless number of good deeds by the Tsar Martyr was unknown to man, as more then eighty years later, we discover that he assisted in the new Russian Orthodox Churches, that where established throughout Europe and in America. More Russian Orthodox Churches, and Monasteries where built during the reign of Tsar Martyr Nicholas II, as much as 10,000 churches increased, and more then 250 monasteries were also built. For source in this regards read: “The New Martyrs of Russia”, by Archpriest Michael Polsky, p. 112. Also more churches were renovated by the efforts and influence of the Tsar Martyr. Russian Orthodox Church Christian literature also flourished during the reign Tsar Martyr Nicholas II. Such well known publications as: “The Rudder,” “The Russian Monk,” “Soul-Profiting Reading,” “Soul-Profiting Converser,” “Wanderer,” and the ever popular “Russian Pilgrim”. The noble Tsar Martyr Nicholas II also had his disappointments, such as the war with Japan of 1904-1905, and the war with Germany in 1914. All during these times of disasters war, the Tsar Martyr had to face these untold matters up front with great dignity, and honor, as well as sincere love for Russia and it’s people. The Tsar Martyr and his Family where often found in Church praying, and calling for further prayer on behalf of Russia. In spite of all the efforts and sacrifices the Tsar Martyr made for his deep Christian belief in God, and for Russia, revolutionist began to turn against him, who saw this as a great opportunity to gain control over the Empire. The the Tsar Martyr Nicholas saw the spiritual events within Russia, that atheism was now becoming a great temptation that was heavily influenced by the philosophers of the early days in Europe. Even the Righteous Wonder worker of Kronstadt, Archpriest John, the last great prophet of Holy Russia, who clearly foresaw the approaching catosprohe, repeatedly exhorted his countrymen to repent and return to their former piety and support their God-anointed ruler or face untold disaster, both here and in the world to come. St. John of Kronstadt, was canonized as a saint by the Russian Orthodox Church Outside of Russia, on June 3, 1964, in America. St. John of Kronstadt is spiritually well known for his God loving pious life, and in sharing the teachings of Christ our Lord with others with the well known book he wrote as a diary: “My Life In Christ”. St. John (Maximovitch) of Tobolsk, relative of St. John (Maximovitch) of Shanghai and San Francisco. and St. Sophrony of Irkutsk (glorified in 1918). All of these glorified saints of Russia, gave each member of the August Martyrs Tsar Nicholas & Family, great inner spiritual strength during their times especially while under house arrest in Tsarskoye Selo, then Tobolsk, and finally in Ykaterinburg, where all of the Royal Martyrs, and Friends found theirholy martyrdom on July 17, 1918. Prior to the Holy Martyrdom of the Royal Martyrs, one could find each Family member in deep prayer, as if they where making preparations for their fate, as their lives where as if they lived in preparations to go to Golgotha, and to be all crucified, all seven of them on one Cross. Now that the Tsar Martyr Nicholas II, Tsarina Martyr Alexandra, Tsarevich Martyr Alexis, Grand Duchess Martyr Olga, Grand Duchess Martyr Tatiana, Grand Duchess Martyr Marie, and Grand Duchess Martyr Anastasia, are all considered saints, and this holy glorification and act of Holy Canonization took place in Moscow, Russia on August 19-20, 2000. Precious are these Royal Martyrs, who now stand with the same saints they piously acted upon to have glorified, while they where on this earth, now join these same saints in the Kingdom of our Lord God. Tsar Nicholas & Family,Pray Unto God For Us!